It was during a visit to the Hepworth Gallery in Wakefield last week that I came across Henry Moore’s excellent drawing of Bevin Boy miners. It put me in mind of the mining memorial that I created for the Bevin Boys, sited at the National Memorial Arboretum in Staffordshire back in 2013. I worked with former Nottinghamshire Bevin Boy Harry Parkes to create the work. We travelled to Southern Ireland to choose rough blocks of Kilkenny limestone for the piece, deciding that to best echo the nature of the work and conditions down the mines, it needed to be rough and craggy, certainly not a polished granite monolith. 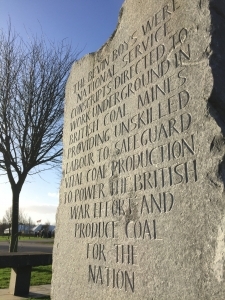 The memorial consisted of 4 stones with unpainted inscriptions chiselled into the rough surfaces like miners scratches on the coal face walls. The grey stone turning coal-like black when wet gives this memorial an unglamorous and workman-like feel.